J Korean Med Ophthalmol Otolaryngol Dermatol 2019;32(1):1-15. J Korean Med Ophthalmol Otolaryngol Dermatol 2019;32(1):16-31. J Korean Med Ophthalmol Otolaryngol Dermatol 2019;32(1):32-41. J Korean Med Ophthalmol Otolaryngol Dermatol 2018;31(4):96-107. J Korean Med Ophthalmol Otolaryngol Dermatol 2018;31(2):152-159. J Korean Med Ophthalmol Otolaryngol Dermatol 2018;31(3):1-11. The Journal of Korean Medicine Ophthalmology & Otolaryngology & Dermatology(JKOOD) is an official journal of the Korean Medicine Ophthalmology & Otolaryngology & Dermatology Society. It was launched in February 27, 1988 and accepts literature research, experimental research, clinical trials, clinical statistics, case reports, diagnosis and treatments in any field of Korean Medicine Ophthalmology & Otolaryngology & Dermatology. It is published quarterly (February 25, May 25, August 25, November 25), with articles in Korean or English accepted through the process of peer review. 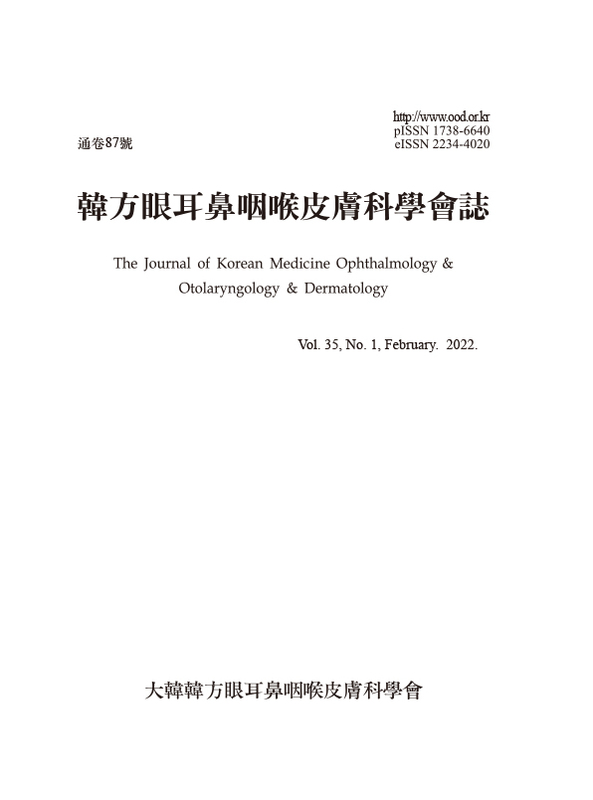 The official title of the journal is 'The Journal of Korean Medicine Ophthalmology & Otolaryngology & Dermatology' and the abbreviated title is 'J Korean Med Ophthalmol Otolaryngol Dermatol'. This journal’s aim is to contribute to the cure of and education about ophthalmological, otolaryngological and dermatological disease and the advancements in ophthalmology, otolaryngology and dermatology. Manuscripts are categorized as original articles, reviews and case reports. The journal is available free in both print and electronic from at http://www.ood.or.kr/ Manuscripts should be sent to the editorial office by article centribution management system. Some or all articles in the journal are indexed in Korea Citation Index (KCI), DOI/Crossref, and also searchable through the Google Scholar. The Korean Medicine Ophthalmology & Otolaryngology & Dermatology Society is a research institute on physiology, pathology, and treatment of areas exposed directly to the outside of the human body, such as ophthalmology, otolaryngology, and dermatology. To learn about these diverse areas of content, we need more and more information sharing, and we want to bring this information sharing online, so we can act more faithfully as a true korean medicine specialist. In addition, we publish a quarterly academic journal in compliance with medical ethics and research ethics. We will open the way for all korean medical doctors interested in or related to our academic community, as well as those currently limited to each university. We also make efforts to become a society conducive to the development of korean medicine through the appearance of an open society. We will discuss the future blueprint of our society with the directors and members of the association to set an example for other academic societies. In line with the globalization of korean medicine in the future, we will be able to serve as a professional medical doctor for the advancement of the true world of korean medicine.